Sea Rex 3D swims into IMAX! Explore an amazing underwater universe inhabited by larger-than-life creatures that ruled the oceans millions of years ago in Sea Rex 3D – now showing in HMNS IMAX!. Guided by Georges Cuvier, considered by many to be the father of paleontology, viewers learn about predators such as the ichthyosaur, plesiosaur, and mosasaur. These ancient creatures could grow up to 50 feet and could weigh as much as 15 tons. Learn about the Triassic, Jurassic, and Cretaceous eras and how life evolved in the deep oceans of Earth. See a mosasaur battle the Great White Shark’s ancestor and witness the mating habits of the plesiosaur. You’re going to love the film’s time line of the history of the Earth, showing the evolution of the first single cell organisms to the mammals that evolved and began to walk on land. What I found fascinating is the amount of time each of the dinosaurs ruled the world in comparison to humans. Dinosaurs walked the earth for over 160 million years, while humans have only been around for about 200,000 years comparatively. 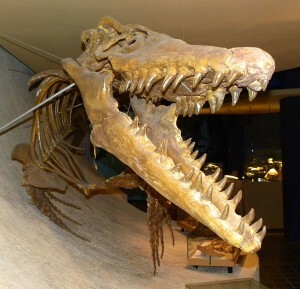 Evidence of giant marine predators were first discovered in a mine shaft in the Dutch city of Maastricht in 1770, when the partial skull of a Mosasaurus hoffmannii was uncovered. Sea Rex 3D takes you on a journey from the creation of earth until the meteor that killed off 95% of life 65 million years ago. Don’t miss this incredible story about our planet’s history and the monsters that ruled the sea for over 120 million years. Sea Rex 3D is now showing in the Wortham IMAX Theater. See show times on our Film Schedule.